TV show to watch, checking its ratings on IMDB has become the norm for many. But it’s not every day you find a Hindi film scoring high ratings. So a quick glance at the IMDB page of Hindi film, ‘Karwaan’, before going to watch it added to the suspense. This movie has scored 8.2 out of 10! In many ways, one of the big driving factors for this movie was the curiosity it had built among the public. Not only did this movie have a unique story line as suggested by the trailers, there were so many big personalities in the film. For starters, if you follow theatre, the film’s direction and screenplay was by Akarsh Khurana of the famous Akvarious Productions. You have one of the brightest stars in the theatre world, Hussain Dalal, writing the dialogues. Moreover, the film’s story was written by Bejoy Nambiar, who has previously delivered ‘Shaitan’ and ‘David’ and Wazir’. And then you have an incredible cast wherein each of the stars has a following of their own for the kind of work they have been involved with. You have Irrfan Khan who is possibly one of the best actors of this generation and who has also endeared himself to younger audience with his collaborations with the likes of All India Bakchod. Then there is Dulquer Salmaan, an Indian film actor who appears predominantly in Malayalam films, with this film marking his Bollywood debut. The story is essentially about two friends and a chirpy teenager, who take a road trip from Bangalore to Kochi. YouTube web series star Mithila Parker (‘Girl in the City’, ‘Little Things’) aces it in her role as the teenager living her own independent life by her own rules. 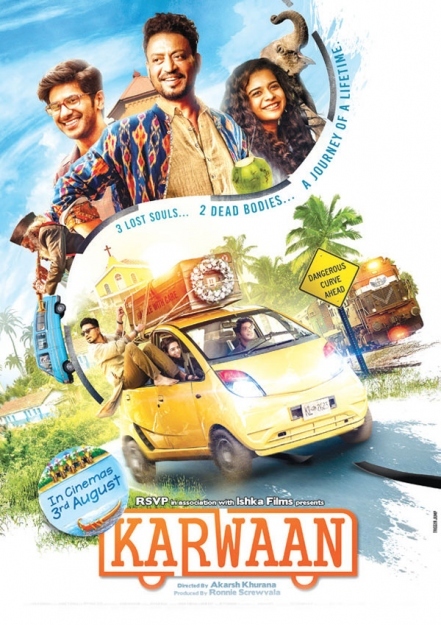 All of the three actors perform brilliantly in their respective roles – Dulquer as a typical Indian boy, who is a victim of the patriarchal system but finds himself judging people from that same system and Irrfan, whose sense of humour and comic timing is possibly the biggest reason for the film’s success and high ratings. Each of these three characters have a storyline that anyone from any generation and background can relate to. And a testament to that argument was the packed hall and the constant laughter among everyone seated, especially some old women who couldn’t stop laughing. The film is a light-hearted comedy, in which Dulquer plays a guy who lives in Bengaluru. It is a road trip with a difference. These aren’t three friends out on an adventure, but rather three misfits on a journey that goes a bit too off-track. Avinash (Dulquer) is a repressed young man who hates his IT job, loathes his boss and would rather become a photographer, but for his father (Akaash Khurana). His father passes away in a road accident and his body reaches another family by mistake. Avinash’s friend, Shaukat (Irrfan), offers his van and company to travel from Bangaluru and exchange the body in Kochi. Enroute, Tanya (Mithila), the granddaughter of the now-deceased person, with whom the other body was exchanged, joins them. It is a trip that neither of them wishes to be part of but end up enduring. The film covers a lot of ground, from brilliantly touching upon the kind of struggles and decisions one has to make in life to support themselves, sometimes even giving up on their own passions, to living your life by a certain philosophy that can help you take on any problem, to being typecast just because of your family background and the expectations that come with it. The film tackles a lot of deep, sensitive issues that most films tend to brush aside in a very subtle manner and yet manages to get into the various layers that make up the family dynamics. While this may seem a bit sober, the film has a fantastic pace and the constant shifting of cities during the road trip and the encounters the trio have with the culture and people from each city feels like you yourself are on that road trip and it can bring memories of your own personal visits to these cities. Besides this, there is a well woven romantic element in the film and this too doesn’t have the feel of your usual Bollywood romantic movie; it has a comic charm that can be seen throughout. One of the reasons I believe the movie has done so well and has resonated with the audiences is because it is, at the end of the day, a good family movie and it talks about today’s times so well. Everyone has faced some sort of criticism when they have wanted to do something but had to face opposition instead based on ‘what society would make of it’. The movie also talks about how friendship evolves among people. There are a couple of feel-good moments that can make you leave the cinema with a smile on your face and ultimately, your money’s worth. The film is refreshingly different and it stands out compared to the recent popular films that have had offbeat storylines. After the film, I was excitedly recommending the same to a friend and the mention of ‘coffins’ made the person wonder if this is really a light-hearted comedy. Simply put, it is one of the better comedies I have seen in a really long time and probably the first Hindi comedy film that I have recommended to my friends and family. Be April Smart: Don’t be a rumour-forwarding fool!